Warwickshire is a county in the West Midlands of England, a landlocked shire of undulating hills and dales. The countryside of Warwickshire is drained by major rivers like the Leam, Avon and Tame. On the banks of Avon is located Stratford-on-Avon, the town which saw the birth of Shakespeare who is also popularly referred to as the Bard of Avon. The region comprises of a fertile loamy soil which is particularly conducive for cultivating wheat, beans, turnips and barley. The region is rich in mineral deposits as well, with an important coalfield existing in close vicinity to Coventry. Other notable mineral deposits found here include ironstone, freestone and blue flagstone. Also, since the area was once covered by dense forests, the lumber industry enjoys a prosperous ride. Criss-crossed by canals and railways, Warwickshire saw major growth as an important centre for the textiles industry during the age of the Industrial Revolution. 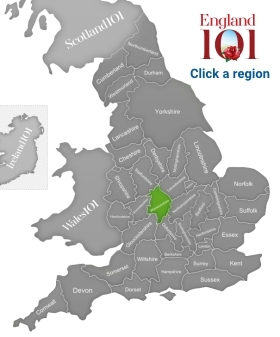 The major industrial hubs were Birmingham and Coventry, and the county even played a historically important role in the English Civil War. Today, the county leads a bucolic life with a sparsely populated southern half mainly characterised by grazing grounds. The modern Warwickshire still manages to capture the nostalgic charm of the English countryside. Warwickshire enjoys a mild and healthy climate characterised by sunny summers and chilly winters. The region is now well-known for its robust economy and has reported dropping rates in unemployment over the past few years. Apart from traditional manufacturing industries, the county also has a strong base of services-based and research oriented organisations that have benefited from its well-established infrastructure. Over the last few years, the tourism industry has also flourished and the number of people visiting Warwickshire for a taste of its unique charm has been showing a steady growth rate. In Warwickshire, you will encounter a great variety of attractions, ranging from stunning Elizabethan architectural specimens to market towns and Shakespearean legacy. There is no place like Stratford-on-Avon to relax with a romantic stroll down the river and read a sonnet or two. 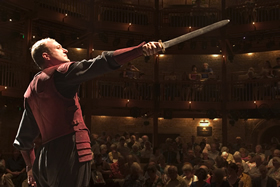 Here you can even watch one of the bard’s plays performed live by the Royal Shakespeare Company. You might also choose to get lost in the Butterfly Park or enjoy Warwick’s intimate charm by cycling down the market squares and cobbled alleyways reminiscent of bygone times. The Warwick Castle, the Kenilworth Castle, Anne Hathaway’s Cottage and Stoneleigh Abbey are other notable attractions that will definitely fascinate anyone intrigued by history. 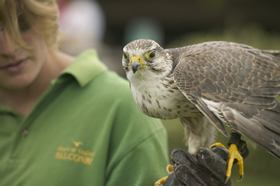 Warwickshire also offers numerous events reflecting county’s vibrant life. There is Warwick Folk Festival, which blends the best of folk music and culture, Camper Calling, a family-friendly festival focused on music and nature activities, as well as the Stratford-upon-Avon Poetry Festival, the UK’s longest running poetry festival. Curiously, in Warwickshire, not even the festivals are too wild or noisy – they are just an opportunity for the local communities and visitors to come together and experience the magical atmosphere this county is known for. Warwickshire encapsulates the English spirit of a laidback countryside from one of Jane Austen’s novels. An escape into the charming county is undoubtedly a welcome breathe of fresh air. 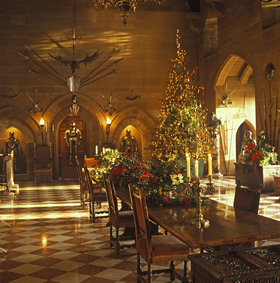 Christmas decorations in the Great Hall at Warwick Castle, Warwick, Warwickshire. 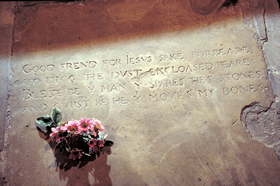 Holy trinity church, Shakespeare's gravestone, Stratford Upon Avon, Warwickshire. 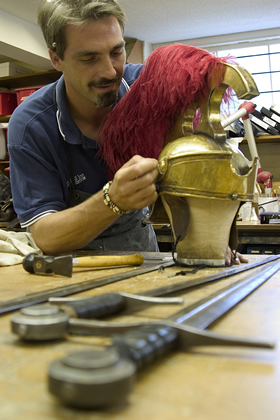 Roman weapons and armour being made ready behind the scenes in the Royal Shakespeare Company's workshops, Stratford-upon-Avon, Warwickshire. Royal Shakespeare Company performance, Stratford-upon-Avon, Warwickshire. Woman with bird of prey, Shakespeare countryside museum, Stratford-upon-Avon, Warwickshire.